It’s been a bit of a busy time lately and I keep trying to find time to update this blog but fail miserably. It’s usually because I’m chasing a child around, working on an editing job, or knitting or designing. The designing part has been the most surprising part to that list. I have been preoccupied with designing a knitting pattern for the last few days. I took part in Aroha Knit (Francoise’s) #initiateknitdesign five day course and by the end came out with the beginnings of my first written pattern. Some parts were harder than others. Finding time to knit up a swatch was a bit of a challenge when I was also running around after two little ones because daddy was away, and then translating my successful swatch design to the pattern was even more of a challenge. What worked on a square, did not work at all on an ever-expanding shawl. From casting on 12 stitches, the pattern is worked until there are 282 on the needles. The stitches increase by one every odd row on only one side. And then to be written with cable stitches rather than SSK and M1 stitches. The particularly surprising thing was that the cable stitches went on top of each other rather than a left-leaning diagonal pattern. It was all rather mind-boggling and I frogged 21 times (give or take a few) but finally got there. I have now found the final pattern I am sticking with. It’s this one here. I originally wanted to use one light blue yarn and one sandy one but then realised I had a combination of both in the Suave sock Crushed Melon on Ice. It is 50% superwash Merino wool and 50% mulberry silk and it’s a very soft and silky combination. I used it a week ago for the Persephone crocheted shawl and it’s lovely to wear. Very soft. The crushed melon colourway sold out very quickly but I dyed up a similar colour but brighter and more vivid: Orange in the Sky. The pattern did great when it was first released and there have been nearly 3500 downloads. It was number one on the Hot Right Now chart for three days. A month later there have been some people who have made it and helped me sort out more problems with the pattern. I was so excited about releasing a pattern that I sent a swatch to a yarn company for a new pattern and it got accepted. I am in the process of knitting it up and writing the pattern. A third pattern was rejected from a magazine but I had done a terrible job on knitting a swatch to show what it would look like. I’m now wondering whether to use it for my own yarn or to try to submit it elsewhere. It’s a bit of a niche pattern so I’m still thinking about it. That’s it for the pattern business. I have set up a Zanetto group on the Ravelry forums for any pattern support required. My knitting news seems to expand and change by the day and invariably I just don’t get around to writing it down. At the back of my mind there is a thought of cataloguing different ideas, techniques and patterns in a more coherent and sequential way. A taxonomy of knitting, if you will. I haven’t yet because I worry that having an order will take away the fun of discovering new things but the idea is there. I have discovered new yarns, discovered designers and patterns and cast on a few times. I’ve also won a few patterns! Louisa Harding Amitola range of patterns; I knit a shawl for Mersina’s aunty Bridget recently and have begun another one with the Follow Your Arrow KAL. I liked the yarn well enough but it wasn’t until I saw the Louisa Harding Amitola patterns however that I became excited about its potential. I am now tempted to frog my just-begun-shawl and save the yarn for something else. Talking about frogging, here’s a clip from NPR on the etymology of the word. Brooklyn Tweed’s Wayfarer scarf is my current project. I’m not entirely convinced by the Rowan Tweed yarn I’m using but I’m getting more and more used to it. I love the design and the idea that you can create these ripples just through different types of stitches. One of my pictures has been selected as one of 10 finalists in a Brooklyn Tweed competition so if you feel like voting for the one with the three little people (I’m the one on the left) on the boot of a car, then click through to here. All the pictures are so cute. Kate Davies has made my favourite lists recently after Beshley’s Wool Shop (now shut down) posted about her owl jumper. I bought the Peerie Faerie hat and Paper Dolls jumper to try. I’ve been in the mood for some Fair Isle knitting for a while and had all the colours for the hat in Drops Karisma, apart from the greens which I ordered from wool warehouse. After my sock debacle over Christmas and all the way through to March/April, I became very sick of them and never wanted to see another pair. I got a bit excited with the Regia fluoro yarn however although it isn’t the most amazing in terms of texture and washing – the colours run. And now I’m still excited after knitting up some baby booties. I had to knit three socks because my gauge was so off on the first one and they were way too dense. By the third sock however I had the technique down pat and actually enjoyed all the decreases and the toes and the heel and the gussett. I’d happily knit a few more of these little guys and am thinking of selling some so let me know if you’re interested. Sockupedia looks good from the reviews so I’d like to take a look at that at some point. Love.Sock.Knit is a delightful collection of intricate but not-too-complicated, hopefully, sock patterns. I have some soothing, and bright sock weight yarn from Expression Fiber Arts with which I’m casting on the BFF socks and then hope to knit a few more pairs from the Cookie A book. Christmas presents – My second tiny person is due to be born at the beginning of December so I thought my Christmas purchases needed some planning ahead this year. For my little people’s dad I have found a design for a cardigan that he likes and bought some Cascade Eco wool. It took three attempts to match the gauge on the swatch but I’ve now got it and am ready to cast on any day. I have bought some Sublime Vivacious Yarn for a cardigan for my sister but at £14 a skein I’m pacing the purchases. I recently found two more skeins at 30% off when Fyberspates had their last sale (code: lastsale) before stopping retail business. The yarn itself is half merino and half silk, very squidgy, silken and soft – definitely sublime. I’ll stop there for now but would love to hear other suggestions about designers and yarn if you have any thoughts. I’ve called this post Ephemeral Knitting rather than ‘My week in knitting’ because it occurred to me as I was writing the second week, that I was putting all the stuff together which could be found in something called a magazine. Hooray, I thought. I’ve always wanted to create a magazine and this might be the ideal way of working off the angst I have about opening a yarn shop which I can’t afford. Following the kind-of-success of finishing my first sock (of a pair) I have been fascinated with sock yarn. Ravelry is a knitter’s community paradise with forums, groups, patterns, yarns and anything to do with knitting or crocheting. I like to read some threads to get ideas and learn about various knitting techniques or patterns. Variegated – exhibiting different colours, especially as irregular patches or streaks. There’s a sale on Sock Yarn with 20% off until March 24,2014 on KnitPicks. There’s this sock tool kit but I can’t tell how useful or not it would be. This Tube socks pattern from the Knitting Bunny looks very nice so it’s on my list of ones to try out. I’ve also had time on the couch since being ill with a chest infection so have been trying a Singular lacy rib stitch from Purl Avenue. I have been coveting the yarn that goes along with this Wrap, when not coveting the actual wrap itself. I was impressed with how beautiful and simple it looks with the delicate colourwork. A cable stitch that doesn’t need a cable needle. Twisting the Barbara Walker Way – I’ve not tried it out yet but it sounds fun, especially after forgetting my cable stitch holder this morning and having to improvise with a key ring. That was some stressful knitting. @purlavenue posted a blog post on a Stockinette Elongated Stitch which contains a dropped slip-stitch which I think looks very similar to this hat pattern I’m trying to find, apart from the slant. When I suggested it to her she suggested I try the Turkish Slanted rib stitch, so I did. Close, but no cigar, yet. I’ve finished my daughter’s scarf in neon orange Schachenmayr and so I’ve been exploring how long a scarf should be anyway. I don’t know. If anyone has any information about this then let me know. She still doesn’t like it. I had forgotten which yarn I had bought for my socks and then discovered on the website for Beshley’s Wool that it was Artesano British Wool. To my even greater pleasure, I found two skeins of soft Artesano wool in Red and purple that I had bought months ago and had stashed away. My other favourite yarn this week is the Madeline Tosh Vintage and it can be bought from various places but here is a store in the UK. A lovely store with Uncommon Thread. Knitpicks http://www.knitpicks.com/ – Hugely popular but I’ve just discovered them. Loop – beautiful and wonderful yarn. Amirisu – A Japanese knitting magazine. Very elegant. This Ravelry thread on what to do if you want to design knitting patterns is a great resource for anyone interested in that kind of thing. I learnt, and still learn, how to knit patterns through YouTube and WikiHow or Blogs on the web so I am hugely grateful for all the resources out there. On the Mystery Knit-ALong I finished a few weeks ago, one of the trickiest 3-to-5 stitches was explained through the use of video. When I bought my spinning kit, I had no idea what the instructions were telling me to do so I looked it up on YouTube and managed to spin some yarn that night. The knitting videos on the Purl Bee website are very helpful. I like knitting kits because everything is all ready to go. No delays, no wait no having to leave the house. Also, I really like the scarf I first knit for my little girl and the one I just finished. The Boston Schachenmayr yarn is soft and thick and bright, oh-so-bright, and the end results have been quite fabulous. Let me know If anyone would like to buy a scarf kit containing two skeins of yarn, knitting needles size 6 1/2 mm and some instructions and pictures of how K1P1 rib and K2P2 rib come out. I’m going to research different sizes and will list some colours too. The cost will be £15 so I can try it out. And the final pattern is for a backpack from Lion Brand. I think I registered first before I could access the pattern. It looks useful. Happy knitting until next week. I spend more time on knitting than on anything else these days, so I thought it would be useful to keep track of the things I do and find. Knitting lessons – The Homemade Mama teaches many different skills for knitters with skills from beginners to more knowledgeable. All materials and patterns are provided and the cost for 2.5 hours is only £15. Verena Stricken – A German knitting magazine with some out-of-the-ordinary designs and patterns. Stickpodden – A Swedish podcast about knitting which I discovered from someone knitting a hat on instagram (see below for Kirstin Kurbitz hat). It is so great it makes me want to learn Swedish just to understand it. Stitchlinks – In my cyclical wonderings about whether I’ll ever study for a PhD, mostly led by my love of university libraries and nostalgia at exploring the American Literature shelves, I Googled PhD in knitting. One link was for some Doctoral work in the therapeutic value of knitting, with funding secured by Stitchlinks. There is information about the benefits of knitting, or more accurately, about the benefits inherent in the externalities of knitting, i.e. the side affects, as such. Ravelry is a large and rich community for all types of knitters and commuters so this is a firm favourite. The new thing I discovered this week was the Patterns forum. I discovered the pattern for Karin’s Kurbitz hat from Stormblomma who I follow on Instagram. My “cute cable socks” went from an unfinished beginning to a complete single sock which fits only with a lot of effort. Still, that’s progress, and it’s a real sock. Mersina’s scarf in neon bright orange Boston from Schachenmayr, my new favourite yarn for scarves. I cast on 16 stitches and am doing it in K1 P1 rib. I like it. The yarn is soft and lovely and thick and warm. I finished the shawl for the Follow Your Arrow Knit-a-long. My final pattern choices were AAAAA but turns out I didn’t love the initial A so I’ve started a new shawl and am beginning with B.
I have started my new knitting project with a speckly and silky wool called Country Tweed. I bought the wool in a few different colours and this is the one I’m using now. 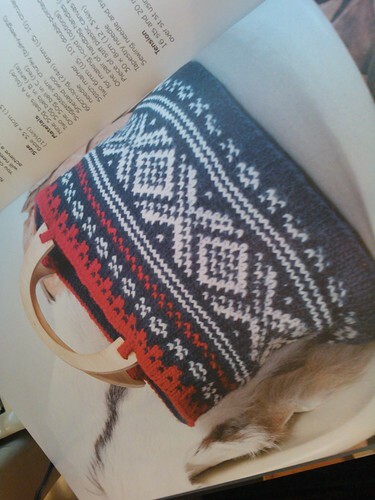 My previous project was a handbag based on a Nordic pattern. I used a round needle and had to carry a notebook with me everywhere to keep track of my rows. It was lots of fun but a bit fiddly so I’d been looking for a project where I could just knit. Well I’ve almost found it. I can mostly just knit once I get the hang of it all. There are only 16 steps to this pattern and it includes the bonus of a new knitting skill which I’ve wanted to try for a while – cable knitting. The pattern I’m using is the Basketweave Cable Scarf but on 4mm needles (or number 4 needles, I can’t remember). I had already cast on 40 stitches and knit one row of k2, p2 (knit x 2, purl x 2) so I kept that and added two stitches to the knit parts. I have found a new jumper I love. 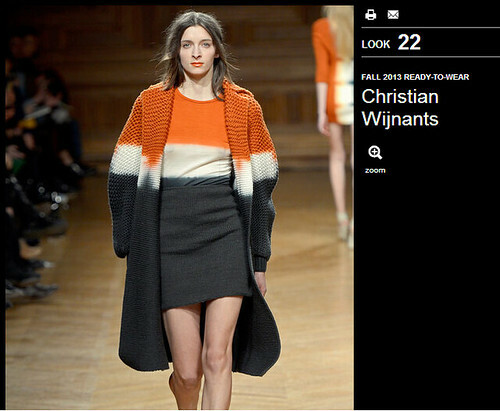 It is a cable knit in a deliciously intense burnt orange. I’m still trying to find the right orange colour for something similar to the jumper. Please let me know if you see any. My new winter cardigan has arrived and just in time. It is warm, it is lovely and it is in just the right colours for me. I can’t remember how much it cost, I think I used about seven balls of Rico Melange wool at between £3 and £3.99 each so around £30. The colour is not exactly as was intended. I still have a lot to learn about how colour and texture translates from wool to knitted product. Mine turned out stripy-ish while the picture calls for a more speckled design. I’m not too fussed though. I love my cardigan and it’s warm and for the first time in ever, I created it myself. I used this pattern from Vogue Knitting and the red-green version of this wool from Budget Wools in Cheltenham and Deramores and spent the last four months knitting, unpicking, resewing, and then doing it again and again. A lot of that time was on the train during my commute and watching Golden Girls. I still need to find four buttons and tidy up those hanging threads. I will do the latter, probably, through YouTube. That’s where I found most of the solutions to my problems. I’m not trying to be artistic, the light was a bit tricky. How does one take a good picture of a cardigan? My cardigan is a little wonky here and there but it’s very wonderful and my first attempt at a big project. Details of my next project, a Scandinavian patterned handbag, coming up soon. I’ve never worn a snood or a bolero and I don’t want more patterns for scarves or baby hats but this is all knitting magazines seem to be providing and at a pretty pricey cost of around £7 an issue. I want to knit something amazing and I found a wonderful pattern from Vogue Knitting for a cardigan I can actually see myself wearing. I struggled to find another great pattern though so instead I’m going to try this whole thing backwards. I will first find the knit I want to make and then find the colours and pattern. I know little about the fashion world but a friend on Facebook was at London Fashion Week professionally and this inspired me to take a look. 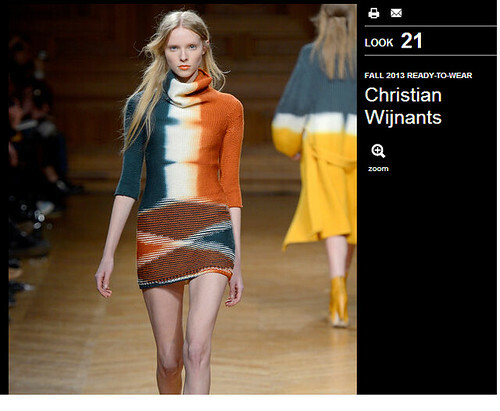 She recommended Christian Wijnants who won the Woolmark award in 2013 and whose clothes can be found at Harvey Nicholson. The following pictures are from his ready-to-wear collection. This long knit cardigan which sees a melting combination of cobalt blue, white and a golden yellow colours is stunning with its very simple design. Not as long as the one in golden yellow, this blended three-colour piece has a brighter burnt orange beginning with bigger squares in the knit which reduce to a subtler pattern. The close fit dress with the three colour layered skirt part is just stunning. That’s the selection of items I’d like to knit. It doesn’t have to be perfect but I’d like to aim for something which is rather wonderful. The next posts will be about finding the right materials and colours, knitting stitches and patterns. I just don’t seem to have the time to do anything at the moment so I thought I’d post something quickly rather than not-at-all.